Got it, thank you so much for the help! I hope that I will be able to return the favor and help someone else on this site find a missing or back up friend for their child! 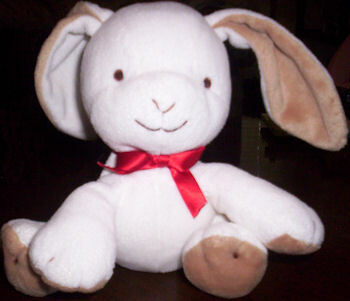 I’m looking for a Carter’s about 3-4 inch tall white rabbit with brown paws and inside ears, wearing a red ribbon around its neck. It was sold in early 2009, and he has a style number of 41547 0509 po#11290. I was searching for a replacement bunny for my daughter and came upon this site (when the photo came up my daughter shouted DUNNY, which is bunny for her)! The fear of losing bunny is almost too much to bear, so I am looking for a backup. Bunny has become part of the family (we have even had to let Bunny pose with us in family photos), and my daughter can’t do anything without her good friend! I can’t thank you enough for the ebay tip! Unfortunately someone bought it before I could but just knowing that there are more bunnies out there gives me hope!